Crew scheduling for TV, film, video, commercials, VR & 360°! Super-integrated with call sheets, time sheets & meal management! Schedule your crew – who works when – and export working hours records. 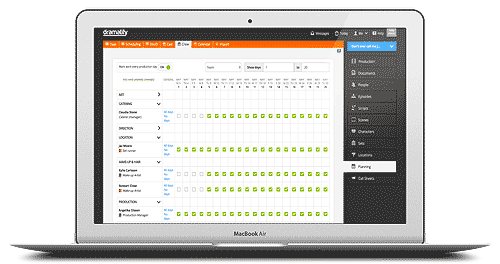 Dramatify’s crew scheduling not only creates a crew list in the call sheet, but also integrates with time sheets and food management. Crew schedule with an easy interface where you simply tick in the days each crew member works. To make work faster, you can speed add all or no dates for everyone, or add all or no days per person. The crew list will appear automagically in the correct call sheets and also reflect automatically in time sheets and food lists. The daily crew automatically reflects in the call sheets. Crew schedule automatically reflects into Time Sheets. Crew schedule automatically reflects into food & catering list. Top image by Alan Cleaver / Flickr (CC BY SA).